Some breast cancer cells make (overexpress) too many copies of a particular gene known as HER2. The HER2 gene makes a protein known as a HER2 receptor. HER2 receptors are like ears, or antennae, on the surface of all cells. These HER2 receptors receive signals that stimulate the cell to grow and multiply. But breast cancer cells with too many HER2 receptors can pick up too many growth signals and so start growing and multiplying too much and too fast. Breast cancer cells that overexpress the HER2 gene are said to be HER2-positive. Herceptin works by attaching itself to the HER2 receptors on the surface of breast cancer cells and blocking them from receiving growth signals. By blocking the signals, Herceptin can slow or stop the growth of the breast cancer. 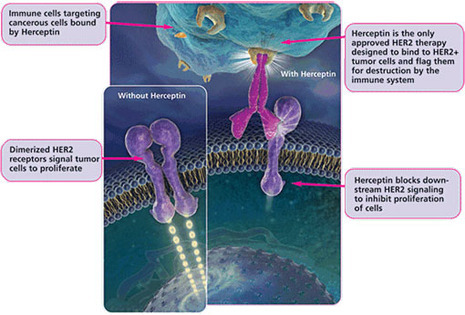 Herceptin is an example of an immune targeted therapy. In addition to blocking HER2 receptors, Herceptin can also help fight breast cancer by alerting the immune system to destroy cancer cells onto which it is attached. Herceptin® (Trastuzumab) is the first humanized antibody approved for the treatment of HER2-positive metastatic breast cancer. Herceptin is designed to target and block the function of HER2 protein overexpression. Research has shown that HER2-positive breast cancer is a more aggressive disease with a greater likelihood of recurrence, a poorer prognosis, and a decreased chance of survival compared with HER2-negative breast cancer. 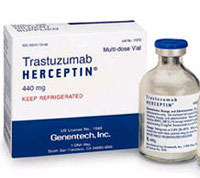 Herceptin (trastuzumab) is a monoclonal antibody. Antibodies are substances the body produces to help fight infection or other foreign particles. Monoclonal antibodies are made in the laboratory, and some are designed to attack specific cancer cells. Herceptin targets cancer cells that “overexpress,” or make too much of, a protein called HER–2 or erb B2, which is found on the surface of some cancer cells. Herceptin attaches to the HER–2 positive cancer cells and slows or stops the growth of the cells. Herceptin is used only to treat breast cancers that are HER–2 positive. HER–2 positive cancers overexpress the HER–2 protein or have amplification (too many copies) of the HER–2 gene. Approximately 20 to 30 percent of breast cancers overexpress HER–2. These tumors tend to grow faster and are generally more likely to recur (come back) than tumors that do not overproduce HER–2. Trastuzumab (Herceptin®) is drug that targets a protein called HER2, which is found in high levels in some breast cancers. Trastuzumab may be recommended, in addition to chemotherapy, if your breast cancer is lymph node positive, HER-positive, or node-negative but at a high-risk of recurring. Trastuzumab is given by IV once per week (or once every three weeks), usually for one year. It is generally given after chemotherapy has been completed. The most common side effect of trastuzumab is fever and/or chills. Heart failure develops in about 3 to 5 percent of women treated with trastuzumab. Trastuzumab-related heart damage may not be permanent.